Home > COMET INDUSTRIES BELTS > Comet 203591 (A or DF). Comet Industries belt 994-80 > 204332A (3-Pack) Insert buttons. Manco 6804 buttons. 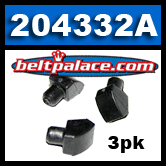 204332A (3-Pack) Black Insert buttons (non-snap). 204332A (3-Pack) Insert buttons. Manco 6804 buttons. Comet Industries part #204332A 3-Pack of “Black” Insert buttons replace worn out, missing, or broken buttons on Comet 20 Series, 30 Series, and TAV Go Karts including Manco 6808, Kenbar 300-015A models. These push-in retaining buttons are commonly found in a Go Carts, Golf Carts, and Mini-Bikes. Same as MANCO GO CART'S Lower Torque Drive Buttons "Manco 6804"
Made by Comet Industries. Replaces original Jonsered/Lennartsfors 5310120-70 part. ***WE STRONGLY RECOMMEND REPLACING ALL BUTTONS AT ONE TIME. YOU SHOULD PURCHASE TWO 3 PACKS. DO NOT RUN WITHOUT ALL BUTTONS IN PLACE! Genuine Comet Industries Parts! Use heat resistant glue or contact cement to fix in place. Comet 219818A (3-Pack) grey Insert buttons (snap-in). These Comet Industries part #219818A 3-Pack of “grey” snap-in Insert buttons replaces worn out, lost or broken buttons on Comet 20 Series, 30 Series, and TAV Go Karts including Manco 6808, Kenbar 300-015A models. Genuine Comet Industries Part made in USA! 219456-A Driven Clutch. GENUINE COMET INDUSTRIES MODEL 31D. REPLACES TORQ-A-VERTER (TAV) 30 Series 217610A, COMET 219456A-W1. Requires Asymmetric Drive Belt (Standard V-Belts WILL NOT work). Comet 204714A. Package of 1 Retaining Ring for Comet Industries 20/30 SERIES Driven Clutch. Comet Industries 204714-A. 200349A Replacement Bronze bushing (Single Pack) for 3/4" Bore Drive Clutch. These Comet Industries part #200349A replaces worn out or lost bronze bushings on Comet TC88 Series, 20 Series, 30 Series, and older TAV Go Karts including Kenbar 300-008, Comet 200349 models.